From 12-hour slow roasted lamb, wine bottled in neighbouring vineyards to craft beers chosen by the locals, Junction gathers all the region has to offer and puts it on display for all to see, smell, taste and share. Quality food is simply a devotion to seasonal, local produce and meticulous care in bringing it to life on the plate. At Junction, the emphasis is on a truly social experience and that extends beyond the fantastic shared dining menu into the relaxed, warm environment of the venue itself. Choose from our delicious five or seven course Feed Me menus, where Head Chef Dave Palmer will pick carefully selected plates for your table to share. Our comprehensive drinks list forms an integral part of Junction’s promise to provide an unrivalled drinking and dining experience. We aim to seamlessly fuse wines and premium beers sourced from the very best global regions with an extensive selection of local Victorian varietals. Our regional focus is further complemented by a considered selection of the world’s premium spirits which are translated into an exciting cocktail list driven by fresh fruits and herbal flavours. By now we assume you’ve all heard about the newest craze in Echuca Moama – The Strawberry Pick! A PYO Strawberry farm on Lady Augusta Road Echuca that has all the kids (and adults) talking. We had the privilege of hosting Wayne, Matt and Sarah for the Farm to Plate experience at Junction Moama. These guys had the most beautiful stall with the tastiest, reddest, freshest strawberries you ever did see. The Strawberry Pick is the creation of Matthew Stewart and Wayne Mattschoss, workmates who became friends and now business partners. The vision for The Strawberry Pick is to offer a fantastic strawberry picking experience that creates enduring memories. How long has The Strawberry Pick been operating? We opened for the first time ever on Melbourne Cup Day this year. After two years of preparations and a flurry of activity in the days and weeks leading up to this day it was extremely satisfying to reach this milestone. In our careers and travels, we came across many Pick Your Own (PYO) farms that had sprouted from commercial farm interests. We thought, why not do it the other way around and start up a purpose built PYO farm with the goal of building the best experience for our customers we can envision. What did you guys do prior to starting The Strawberry Pick? We were both working (together on many occasions) as horticultural agronomists for the same company. Matt as a nationwide Nutritional Agronomist based in Victoria and Wayne a regional production agronomist in the Adelaide Hills of South Australia. For a Pick Your Own farm experience they can’t be beat – Adults and Kids love them equally and they produce for almost ¾ of the year in this climate, so we can share the experience with customers for most of the year. Technically, they are a challenging crop to grow and allow us to flex our agronomy muscles, which will hopefully get bigger now we’re in the box seats! Is there a specific knack to growing the perfect strawberry? If we ever see one, we’ll step on it! That way, we will always have something to strive for in our growing endeavors. There’s a lot to consider when growing strawberries and we still have a lot to learn. We’re fortunate that we’ve been exposed to a lot of commercial growers and have been able to learn from the best. The most important factor for us has been variety selection. The variety we currently grow comes from California and is called ‘Albion’. It doesn’t produce as much fruit as other varieties out there but it absolutely tops the charts when it comes to flavor – and for us that’s what it’s all about. What’s your number one tip for the ultimate strawberry eating experience? We’d recommend eating the strawberry at ambient temperature as that’s when the full flavor comes through. When can people visit The Strawberry Pick? 7 days a week, between 9am-5pm. The season runs approximately from late October until late May. As we are at the mercy of the weather, it is wise to check our Facebook or webpage to ensure that we are open, especially during rain events. Where can we purchase your strawberries? Our recommendation would be to purchase them via the Pick Your Own Experience at The Strawberry Pick Farm, as it truly doesn’t get any fresher or better than that! Otherwise, you can purchase our pre-packed strawberries direct from the Farm or in town from our local retail partner, The Pear Tree. For those wanting them done a little bit fancier, Junction have been featuring us on their menu, which we recommend trying out also! Where would you take a visitor for an essential country food experience? Matt – Sounds cliché but a Sunday BBQ has been the quintessential inclusive country food experience in my life. My parents have always been very inclusive with their family BBQ’s and it’s a culture I hope to emulate throughout my dining life! Wayne – I recently ate at Junction with my girlfriend who was over from Adelaide. I managed to convince her to make the move to Echuca. I’m pretty sure that the Bharat Spiced Cauliflower played its part in convincing her. If you could visit any city for a day’s eating and drinking experience, where would it be and why? Matt – I’d go to France and ask the locals where the best cheese was being served – I’m told there’s also some nice wine there to compliment. Wayne -A few years ago I had the pleasure of travelling through Europe. During my stay in Rome I tasted the most amazing vegetarian pizza, it was simple and exceptionally flavoursome. I’ve been craving it ever since. What other local artisans or producers do you admire? Why? Matt – I met the extremely charismatic owners of Rich Glen Olive Oil at some recent events and was inspired by their story and by what they’ve created. Wayne – Bruce and Tracey of Bandicoot Brewers. They’re a hard-working couple that take pride in what they produce. Matt – My wife’s home-made pizzas and loads of them. Wayne –My Nanna’s school holiday special: Apple Waffles covered with jam and cream. Ah spring, is there anything better than beautiful fresh greens and flowers at this time of the year!? The team from B&B Basil are on board for September and have some great things to share with us. B&B Basil began as a father and daughter team in 2000. After noticing a lack of locally grown herb products at the Melbourne fruit and vegetable market, George Bobin and Susie Young decided it was time to begin something new and started growing large Hydroponic Basil in pots. Their products were an instant hit at the markets and the demand for their high quality herbs have only grown from there. See below for our questionnaire with Susie and her insight into B&B Basil. Join us in September for a stunning burst of colour and flavour. Especially on one of our new dessert specials, stay tuned. How long has B & B Basil been operating? How did B & B Basil get started? What was the inspiration? Originally we started as George (Dad) was looking to make a change from a very manual type duck farm where our family farm produced duck eggs since I can remember. We both had a green thumb and a love for food. I was in my first job out of school, a trainee in a local Bakery, and had my afternoons free. On a trip to Melbourne markets George got talking to someone about produce and it was mentioned that good Basil was hard to come by in Victoria at the time it was mainly coming down from Queensland. George had a long time passion for Hydroponics and I was keen on producing a bunch in a pot and keeping it less labour intensive. From there we started offering our Basil around local restaurants and then into an agent at the Melbourne wholesale Fruit and Vegetable Market. Bit by bit we grew. Working after work, weekends and friends and family helped out when possible. When time was right Jan & George made the move to sell the Duck Farm which worked in with my first house purchase that had a hectare of land with it. Next came a question from a local grower that small tips of produce were being asked for as the Microgreen trend started to gain interest in Australia. We decided still a nice bunch in a pot style and just grow them small. Starting with our current varieties of Basil we quickly found our next big thing. Over the years our varieties have grown to 40 different Microgreen or Microherbs, a variety of pea tendrils and now increasing demand in our Edible Flowers. Is there a specific product you are most fond of from your business? Our Microgreen Basil is still my favourite with its strong fragrance but followed closely by Salad Burnet as I love its fresh flavour. If there was one thing you loved most about your business, what would it be? The best part is taking the time to get about the farm and wandering through the greenhouses. It could be any kind of weather outside but it transports you to a calm garden with so many amazing aromas and colours. What’s your number one tip for the ultimate herb experience? Keep it fresh, colourful and flavoursome…we eat with our eyes as well so give something new a try…even the edible flowers. Any hot tips for people wishing to use micro herbs in their home? For home use they can be tricky to track down in the grocers. We recommend asking for a mix of 6 or 12 and have a play. Matching some with everything, from entree to dessert. Then with whatever is left blend them all together and you have your own version of Herb Salad Mix which is great on brunch or lunch! If you’re buying them living like our pots they should last out on your bench top for at least a week depending on the variety. They just need a touch of water and filtered light. There are currently tours run through the Bendigo Tourism called ‘From Market to Paddock to Plate’. These are a guided tour of the local farmers market and farms with the catering selected from local produce along the way. Your also finish with a lovely dinner cooked by one of your hosts! Melbourne is my favourite. No matter how many times you go you can always find good quality food and so many varieties of flavour. We probably admire more local regional chefs more that source local food and help bring us idea’s to make us local producers think outside the box from traditional produce. Oooo thats tough. ..can I choose the 8 course degustation please! Introducing the ever so popular Four Pillars Gin, Junction’s August Artisan feature. Gin is undoubtedly a staple spirit for any cocktail, whether that be in the space of a bar or in the comfort of your own home. Four Pillars is the perfect gin for all occasions, a classic gin with a touch that would fascinate and delight even the most hardened gin fanatic. It’s spicy but with great citrus, a truly modern Australian gin. We spoke with the team behind the Australian distillery to discuss how their small country business grew to win several golden awards all across the world, in the space of just three short years. Join us during August to try Four Pillars Rare dry gin and Four Pillars Bloody Shiraz gin. How long has Four Pillars been operating / How did Four Pillars get started / What was the inspiration? So, we established Four Pillars Distillery in the Yarra Valley with a clear purpose: to elevate the craft of distilling in Australia and celebrate the art of cocktail making. We wanted to help people drink better, not more. That journey started with a tour of the US West Coast, from Portland to San Francisco, identifying the techniques and equipment we admired in their burgeoning industry there. So, after a ton of research, including sourcing the best botanicals from across Australia and around the world, we started test-distilling. And 18 months after commissioning a custom-built copper pot still from CARL in Germany, we took delivery of ‘Wilma’ late in 2013. We launched our first batch of 420 bottles of Four Pillars Rare Dry Gin in December 2013. Crafted in a truly modern Australian style to capture the flavours of both Asia and the Mediterranean, this gin was awarded a Double Gold medal at the 2014 San Francisco World Spirits Competition, back in the region where we started our journey. We’ve since released a limited edition Barrel Aged Gin, a ‘gunpowder proof’ Navy Strength Gin, a Bloody Shiraz Gin and three collaboration gins. What did the founders do previous to starting Four Pillars? Cameron MacKenzie (our distiller, educator and resident ginnovator) comes from 15 years in the wine trade: making, selling, marketing and judging some of the best wines in Victoria. Stu Gregor (our Four Pillars mouthpiece and man about town) is a veteran of 20 years in the drinks business, lifestyle PR and events. He owns Sydney PR powerhouse Liquid Ideas. And Matt Jones (the branding brains behind Four Pillars) worked as head of Global Head of Strategy at Jack Morton Worldwide before starting his own boutique brand agency, Better Happy. Explain what botanicals mean for readers who may not know the ins and outs of gin. The botanicals are the ingredients that flavour the spirit through the process of distillation. Juniper berries are the basis of all gins, serving as a sort of canvas. In addition to juniper we use a variety of local and exotic elements, including native Tasmanian pepperberry and lemon myrtle, and Asian spices such as cassia and star anise. And, somewhat unusually, we also use fresh organic oranges in our distillations to give that aromatic Mediterranean citrus character. Our Rare Dry Gin really is our heart and soul. It’s our expression of modern Australia – taking great flavour and influence from our local environment, and from Asia, the Middle East and Europe to create a really contemporary, versatile yet distinctive gin. Well, you might think us biased, but when it comes to amazing produce we do believe it’s hard to beat our hometown of Healesville in the Yarra Valley. It’s just supremely abundant with incredible natural resources and really talented makers who want to share what they do. We have the privilege of working with some great producers in our nose-to-tail gin ecosystem. A bit of Jam and Pickle are legends when it comes to preserves. They make our Four Pillars Gin Orange Marmalade out of the oranges used in our distillations. Jack from Stone & Crow Cheese is the mad cheese professor who came up with the idea of using our stillage to make gin cheese. And Yarra Valley Berkshires have been feeding our spent botanicals to a few black pigs for upcoming gin pig dinners. We’re not entirely sure, but it would involve gin, obviously. And quite possibly dumplings. Ah, cheese, cheese, glorious cheese. Is there seriously anything better than snuggling up by the fire with a hearty glass of red and a slice of delicious French cheese on a chilly Winter’s night? Let us introduce you to L’Artisan Cheese, Junction’s July Artisan. With expertise coming from the heart of France, owner Matthieu Megard brings a wealth of knowledge in producing quality French cheeses in our very own Victorian region. Making a double appearance in Junction’s very particular cheese selection, L’Artisan Cheese is a stand out amongst many Australian cheese producers. How long has L’Artisan Cheese been operating? L’Artisan Cheese started operation in 2010. How did L’Artisan Cheese get started? What was the inspiration? After 2 years in Australia, I heard that the Timboon Farmhouse cheese factory had been shut down and the owner of the premises and famous cheese maker Herman Schulz was nice enough to let me start production there. What did the founders do previous to starting L’Artisan cheese? I was a cheesemaker in France but ended up mostly working for our family company who specialised in cheese making equipment. I couldn’t wait to go back to making cheese for my own company with the added challenge of working in a new and completely different environment. It offers the perfect balance between agriculture, art & creativity and science. It is hard to say which one of our products is my favourite as it changes according to seasons and moods. This said I can’t really go past our Mountain Man, which is inspired by the “Reblochon de Savoie” a cheese I grew up with. It is together mild, complex and so earthy. It always takes me back to my mountains. What’s your number one tip for the ultimate cheese experience? The ultimate cheese experience for me is to share it with the person who made it or with somebody who is passionate about it and to do it in a great atmosphere. I have always understood that taste comes from your brain first, and I always try to speak to the brain before the taste buds. For a country food experience I would take people to Birregurra. I would go to Brae restaurant as I have wanted to do that for ages or for a smaller budget enjoy a simple meal at Birregurra Farm Food and buy some local food in their Deli. In Australia, I would definitely choose Hobart as there are so many great things happening in Tasmania when it comes to food and drink. Again, I have never been there unfortunately. Cheese making is very time consuming! I would first speak about Bundarra Berkshires as I saw them evolve over the years (we see them often at Farmer’s markets). They have their own pigs and started with selling meat. Now they have a range of beautiful Charcuterie with my favourite; Rilletes. I would love them to make Saucisson. Speaking about Saucisson, a really good one is made in Sydney by Jean-Marc from La Bastide. In terms of wine, I would single out our friend Sahne from Basalt Wine near Port Fairy. His organic wine makes the most of the volcanic soil and has a rare minerality that I enjoy a lot. My last meal would be a Gratin Dauphinois. It embodies the beauty of simplicity. Just thinly sliced potatoes and creme Fraiche. I would have nice galette a la frangipane for dessert. Fall in love with Pondalowie Vineyards and their magnificent story of winemaking across the globe, and now in nearby Bendigo. Dominic and Krystina are passionate about their craft and we’re thrilled that they’re our artisan of the month. Join us in June to taste their MT Tempranillo, one of our favourites here at Junction. How long has Pondalowie been operating? Dominic and I established our vineyards in 1997. Our first vintage was in 2001. How did Pondalowie get started? What was the inspiration? Pondalowie was conceived on a camping holiday at ‘Pondalowie Bay’ (Yorke Peninsula, S.A), our favourite spot to rest in-between vintages in Australia and Portugal. Around the campfire one night we decided to use the knowledge and experience we’d gained from our years of making wine in Australia and Europe to create wines in our own style, using grape varieties we were passionate about. We have 25 acres at Bridgewater on Loddon, near Bendigo and also source grapes from premium, artisan growers in Heathcote for another wine brand we’ve started called ‘Pinga Wines’. What did the founders do previous to starting Pondalowie? Krystina studied Oenology (winemaking) at Adelaide University then worked as a winemaker in the Barossa Valley, McLaren Vale and Portugal. Dominic turned a career in wine-marketing to one in winemaking when, after working vintages in Australia, Portugal and Burgundy, he became Chief Winemaker of the Douro Valley winery Quinta do Crasto. Alongside running Pondalowie with wife Krystina, Dominic worked for Quinta do Crasto for 17 years making three trips a year to oversee production and was proud to have helped them achieve their recognition as one of Portugal’s best table wine producers. Because of our background working in both the Barossa and Portugal, we love Tempranillo and Shiraz equally. Our MT Tempranillo and, when produced, our Special Release wines are fond favourites. Our MT Tempranillo is made in a fresh, vibrant, early drinking style based on the Spanish ‘Jovem’ (meaning young) Tempranillo styles—a wine that truly represents the varietal flavours of Tempranillo and the influence of our terrior – ‘Minha Terra’ (a Portuguese expression for ‘my terrior or ‘my home’). Our ‘Special Release’ label is reserved for ‘one-off’ wines and generally represents the best wines produced that year. What’s your number one tip for the ultimate wine experience? Serve wine at the correct temperature. Aim for around 16-18˚C for reds and 11-12˚C for whites. Serving red wines at this cooler temperature allows the fruit flavours to be expressed and the palate to have better balance. The Woodhouse in Bendigo. They cook steak sourced from artisan producers in Victoria and Tasmania over a red gum fire grill – the flavour is amazing. McIvor Farm Old Breed Pork at Tooborac in Victoria –3rd generation farmers who are passionate about holistic farming have created a ‘beyond free-range’ system. Their pork products are amazing. Jonesy’s Milk – for an Australian owned, sustainably produced milk that offers a fair return to our farmers. Welcome our new artisan feature, Jasper Coffee. We had the privilege of meeting Wells Trenfield the Director of Jasper Coffee when he visited us here at Junction. His insight and passion is clearly evident in all that he does and we are very excited to be showcasing this wonderful brand and product to you throughout April. Jasper Coffee is an Australian family owned Specialty Coffee Roaster established in 1989, led by Directors Merilyn Parker and Wells Trenfield. With deep roots in the art world, coffee has become Wells & Merilyn’s palette. They are dedicated to re-humanizing the coffee supply chain, and have formed strong friendships across the coffee world in their exploration and adventure into the unknown. Junction is absoloutely thrilled to welcome Jasper Coffee and their Red Dust blend to our family of regional artisans. Jasper’s ‘Red Dust the Coffee’ was initiated by Outback Academy Australia in a landmark funding campaign involving coffee and Indigenous Communities across Australia. The crux of this partnership, is to support the mentoring initiatives and the ambassadorial efforts of the Red Dust Heelers. See Well’s interview with us below. How long has Jasper Coffee been operating? Jasper Coffee has been operating , it seems , forever. But last report tells me that is not so, and we started in 1989. How did Jasper Coffee Park get started? What was the inspiration? My (life)partner started the business by purchasing a little downgraded overpriced roastery. The inspiration was that she knew absolutely nothing about both business and coffee and that leaves room for anything positive and creative to happen…and at the time, I refused be part of this nonsense. We only ever drank the brown stuff occasionally. I joined the business several months later to “help out” The other inspiration was that there was lots of creative food producers and food retail operators at the time, all exploring the potential of fresh new tastes and directions. We recognised the same could be explored with coffee. What did the founders do previous to starting Jasper Coffee? Both partners were engaged with art. My partner was an art teacher and ceramist, while I was a practicing and exhibiting painter and print maker. We both brought this experience into the our roasting and blending the tastes coffees and how we used graphics and colours of the labels to equate tastes and food experiences. Why Coffee !? Well, since we had no experience with this product, we treated it as a raw palette from which to mix and achieve nuances of equivalent taste experiences, then to create the final compostion as we would a picture. The coffee for us was imbued with meaning. Is there a specific product or blend that you are fond of from your business? There were no presumptions or prerequisites , apart from, we would only sell coffees that we liked the taste of. Our business was not predicated on price but truly on the quality of the product. One of the most memorable coffees we had in our repertoire, was from a single estate in India, called Yellnoorkahn. We had this for maybe 15 years before the entire estate was sold to a café owner in India. Perhaps the everlasting flavour of and story of a coffee from Papua New Guinea, which grows wild in the forest ,and which was one of our first coffees, is among my favourites. But then it is without exception that I love my coffee experiences of Ethiopia, especially Limu or Yirgacheffe. . Perhaps the most exotic experience was a coffee from Flores in Indonesia, which had been deliberately dried and matured for 7 years before we received it to roast…but unable to repeat purchase. What’s your number one tip for the ultimate coffee experience? Number one tip for the coffee experience is to sit in the garden , sip slowly on a filter brew of Nicaraguan Marogogipe, and read the Sunday paper…and respect all the human energy that has poured into the growing , harvesting, processing, shipping, roasting , and making of this humble complex brew. For a great food experience I would take people to Morocco. For the ultimate food experience for a day, I would not go past Paris. Food and wine reflect the ambience of a place, and Paris is turgid in both. I think I would even start and maybe finish with the patisseries, yet perhaps a dabble in the fromagerie and bread shops out of respect. But wait till Melbourne or Addis Ababa for the coffee. Yet, I have to say that best travel experiences often happen around food experiences. Without doubt, the fresh sardines straight off the boat at port , then onto the waiting charcoal grill, to the plate with lemon and charcoal grilled onions and fresh wholemeal Moroccan bread, at Essaouira, is perhaps the place to take a special friend for the most memorable taste experience, while perched at risk on a crate. Since I first met the celebrated winemaker Chris Pfeiffer at his winery in Wahgunyah, I can only say that I have enormous admiration for this craft and tolerance and skill. I have learned to respect the winemakers knowledge of variables and nuances of soil, weather and skills to achieve great taste experiences. My last meal would have to be vegemite on fresh bread with slabs of butter, dressed with mint and walnuts. After Wells visit to us at Junction, we then received a further answer to his question…. So…. For the most memorable and desirable dessert to complement the Vegemite mint and walnut bite, the grand finale has to be the Chocolate marquise, coffee crumb and blood plum gel, but only when indulged with a luscious Tokay sip, pulled together with a chilled double short extraction Red Dust coffee let to settle into sweet intense plum and treacle dark chocolate. Truly mesmerising to the bitter end !! Each month, Junction is proud to introduce you to one of our regional artisans – a special group of people who contribute to the produce and crafted beverages that we offer at Junction. This month we are very excited to showcase our premium Zucchini flower providers, Crossies ‘Cados. Andrew Crossman heads up this business, Crossies ‘Cados is a boutique avocado orchard based on a fourth generation farm in Torrumbarry, right on the Murray River. Not only does he supply us with the most amazing produce, him and his wife Sarah hand deliver! We love seeing them each week and having a chat. We were able to steal some time from their busy schedule to ask them a few questions. How long has Crossies ‘Cados been operating? Our first plantation was put in 10 years ago. And we have been operating as Crossies ‘Cados for 6 years. How did Crossies ‘Cados get started? What was the inspiration? Grandfather was an orchardist in Doncaster. As a young child I loved trees in general and always helped my Grandfather in the veggie garden and with pruning trees. Other than playing tennis as a young adult my only other interest was trees. When I stopped playing tennis I did my nursery apprenticeshipand started cultivating citrus trees. From there I wanted to diversify into something that could keep me on the farm but away from traditional milking or sheep. Avocados was something grown in the Sunraysia area and decided to give them a try. They were a niche market and weren’t grown around here, so I saw my opportunity. Why zucchini flowers and avocados? Avocados – a niche market and new to our area. Flowers were another seasonal crop we could grow to supplement the avocado business as it became established. Is there a specific product that you are fond of from your business? Avocados and zucchini flowers but on a smaller scale the diverse range of product we can have from the farm. e.g. plums, peaches, pumpkins, figs, corn. Plenty to keep us busy. What’s your number one tip for the ultimate fresh food experience? Coming out to the farm in January-February and pick your own fruit, eat it fresh off the tree! Local eatery that stocks local produce. Support the local farmer. Italy for the fresh pasta and so many varieties of dishes. IG’s FIGS for having a go at a premium product in their retirement. Best watermelon on a very hot day! Each month, Junction is proud to introduce you to one of our regional artisans – a special group of people who contribute to the produce and crafted beverages that we offer at Junction. This month we have something extra special, our amazing team from Seesaw Studio who designed and developed the branding concept of Junction. We wouldn’t be here without these lovely folks. Anita Ryley from Seesaw has answered a few fun questions for us. Enjoy. How long has Seesaw Studio been operating? Seesaw was started by Matthew McKenzie and Anita Ryley in 2005, so just over ten years. What was the inspiration behind Seesaw? Creatively, our styles are quite different so we saw the name Seesaw as a balance of our varying aesthetic and approaches. Balance is really the cornerstone of our business – work and life, head and heart, style and substance, clients and creativity. And we wouldn’t be called Seesaw if there wasn’t a little fun in between. What did the creators do previous to opening Seesaw? Matt and Anita both studied design at RMIT and went on to work in small studios both together and separately. Seesaw then started quite organically out of an abundance of freelance work. Honestly the Junction project would have to be one of our favourites as it was a project filled with heart, love and creativity. We are immensely proud of the results. What was your favourite part about Junction Moama branding? Creatively, we loved how the brand reflects the Echuca-Moama region. An artist was commissioned to create a series of exquisitely textured cement vessels that reflect the layered sediment and water levels of the river. Graphic elements reference the curving line of the Murray while mark making and use of copper reflects the local people and the traditional crafts of the area. Menu design fused branded leather and the unique patina of the local spotted gum. Aprons were crafted out of canvas, leather and brass, referencing horse bridals. We believe it is the level of detail and consideration that makes the brand successful. On a personal level, this project was so amazing as collaborated with an extremely passionate, trusting and like-minded client. The project was a success because of all of the individuals involved – from the Architects and Interior Designers through to the Junction staff and management team. What is your number 1 branding tip? Your brand is not what you say it is, it’s what your audience says it is. Understanding your audience is key. What is your favourite dining experience in Melbourne? At the moment we are loving Andrew McConnell’s Marion in Fitzroy designed by IF Architecture. 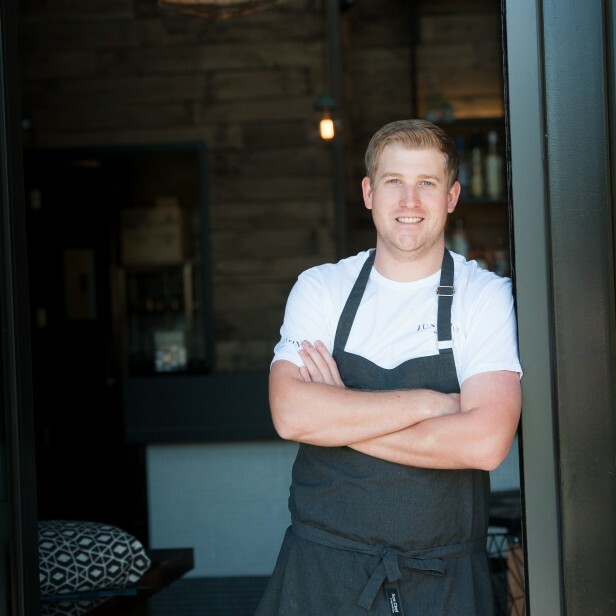 We were also lucky enough to work with the talented Ryan Flaherty at Mister Jennings – an absolute genius in the kitchen. Tuscany! We have both visited recently and the food, wine and stunning location is hard to beat. What other local artisans do you admire? We admire so many local artists, many who we are lucky to collaborate with. We adore Studio Twocan who we worked with on the Junction project, their concrete vessels are unique pieces of art. We also love working with local photographers James Geer (who photographed Junction), Tom Blachford and Kate Ballis. We also really admire painters Julian Meager and Fred Fowler and illustrator Andy Murray. If you had to choose your last meal what would it be? It would be one enjoyed with loved ones. Oh and cold glass of Chardonnay and a Cape Grim scotch fillet from Junction would definitely be on the table! As part of our January Artisan feature, we were excited to get inside the heads of Phil Sexton (Director) and Steve Flamsteed (Head Winemaker) for Innocent Bystander. With some great backgrounds in food and beverage, along with some outstanding wine knowledge, this team have produced some beautiful products that we are showcasing in junction over January. Join us to enjoy Innocent Bystander Prosecco, Pinot Gris, Pinot Noir and Pink Moscato. Head over to our Facebook page to learn how you could win a twin pack of Innocent Bystander pink Moscato each week in January. How long has Innocent Bystander been operating? How did IB get started? What was the inspiration? Owner, Phil Sexton, had a long-held fascination with producing cool-climate pinot noir and chardonnay. It was his desire to produce these styles that led him to uproot from Western Australia and purchase and plant the Sexton Vineyard here in The Yarra Valley. What did the founders do previous to starting IB? Phil Sexton is widely considered one of the pioneers of the craft brewing movement in both Australia and the United States. In 1981, Phil was employed as Brewer by the Swan Brewery. In the same year Phil established (by hand and without money!) Devil’s Lair in Margaret River. Three years later he established The Matilda Bay Brewing Company. By the early-90’s Phil was dividing his time between Margaret River and Perth – running Devils Lair, a coffee roasting business, Dome, and a number of restaurants and bars. After trying to slow down in the mid 90’s, Phil moved to Portland Oregon for 2 years to help a friend with his brewing businesses. While overseas, he sold Devils Lair and it wasn’t long before he decided to return to Australia. During his transition East (to set up IB), Phil and two business partners (ex Matilda Bay colleagues) established Little Creatures Brewing in Fremantle Western Australia; ‘to attend to unfinished business” in the craft beer business. Growing up in Margaret River during the rise of the wine industry, Phil Sexton was captivated by winemaking and the opportunity it offered to engage in agriculture, theater, art and science. In 2003, I (Steve Flamsteed) joined Phil to make the Giant Steps Wines and after we head hunted Suzanne Tyzack from the Sales and Marketing arm of a well known craft brewery, we began to development of the Innocent Bystander Winery. For me, my first qualification was in food in Brisbane in the mid 1980’s. I travelled extensively in Europe in the late 80s and it was whilst travelling in France where I developed a number of culinary passions including cheese making, which would see me later return to France to study this trade. However, it was after working at Chateau du Bluizard in the Beaujolais region that I was inspired to become a winemaker. What is your ultimate wine pairing dish and beverage? 2015 Innocent Bystander Pinot Gris served really cold with Coopers Ale beer battered Flathead tails (on the beach or the shore of a nice river) with garlic aioli and lemon wedges. What is your favourite product from your range currently? 2014 Innocent Bystander Syrah – I think Shiraz or Syrah may prove to be the Yarra Valley’s most exciting variety. There are layers of spice and red berries in that wine and it’s going through fantastic evolution at the moment. Old French Sauternes (really expensive stuff like Yquem) with foie gras on thinly sliced fresh toasted brown rye bread….in France. Home made pork salami with home made wine from the same Italian family (old mates of ours) in the King Valley. If you could visit any city for a days eating and drinking experience, where would it be and why? Lyon – it is the culinary centre of France. Carla and Ann-Marie are making some of the best goats cheese in the country and they are the real thing. We have to order our La Luna each week as it is made to order. Giaconda Winery in Beechworth – Family owned, and Australian benchmark always been amazing and I admire the fact that they have managed to evolve, not just stay the same. How long has Harcourt Perry & Cider been operating? The Cider itself was launched in 2012 when we decided to get serious about producing high quality apple and pear cider. But we’ve been making other apple and pear products for about 15 years now. How did Harcourt Perry & Cider get started? What was the inspiration? We started out by pressing apples to make fresh juice and over the years began making other products too. All our products are derived from locally grown fresh apples and pears. It was actually the abundance of high quality locally grown fruit that was the inspiration for us – by using this local resource it helps the growers and the whole community. What did the founders do previous to starting Harcourt Perry & Cider? Before making juice or cider we had a small fruit and vegetable store in Harcourt – and we still run this business today! It’s a natural progression from the 100% apple and pear juices and cider vinegars we were already making and we’re excited to be producing a truly adult oriented product now that makes the most of the exceptional fruit that grows in Harcourt. Is there a specific dish or way you would recommend to use your cider, or other products? For drinking; our cider goes particularly well with fatty meats such as pork and duck dishes. For cooking; the sky is the limit! Some of our favs include using cider to steam mussels or make glaze for ham hocks. We also produce Apple and Pear Cider Vinegars – these are excellent in cooking and can be used in salad dressings and marinades or to add a fruity tang to pumpkin soup. What’s your number one tip for the ultimate cider experience? My number one tip for enjoying cider is to get it really nice and icy cold prior to cracking the top on it. About 2 degrees is ideal. My current favourite is Annie Smithers’ du Fermier in Trentham, in Victoria’s central highlands. This is quintessential country cooking with local ingredients and eating in a classic country setting. The results are seriously wonderful and delicious. Melbourne! I have travelled all over the world and the standard and variety of Melbourne’s eateries is second to none. You can also get Harcourt Ciders at a number of bars and restaurants there and, last but not least, with the money I save on airfares (by not travelling too far) I will have more to lash out on the best Melbourne has to offer. Adam Marks from Bress Winery, Harcourt. An exceptional and passionate wine maker – and everything he produces is bio-dynamic. Slow cooked pork ribs with cider vinegar slaw and a large glass of Harcourt Apple Cider! 1. How long has Pacdon Park been operating? 2. How did Pacdon Park get started? What was the inspiration? Pete was a British trained chef and I had a business degree and had done some pig farming out in Bunnaloo. We thought we had all the skills we needed for success… little did we know! We converted a derelict dairy building in Bunnaloo into a commercial kitchen, we had a second world war generator to give us our power, and the aid of 50 fellow back packers over a two year period as our budding workforce, we got going. Shortly after starting my now wife Jane arrived and took control of the books. Now we are almost in town on Nicholas vineyard on Perricoota Rd, again in an old dairy but now open to the public. 3. What did the founders do previous to starting Pacdon Park? I was fresh from University, Pete was a disillusioned chef and Jane was a biologist working for the National health service in the UK. The British smallgoods we really missed – pork pies, black pudding, sausages, just happened to be pork. Now we use the whole pig, nose to tail. 5. Is there a specific product that you are fond of from your business? 6. What’s your number one tip for the ultimate pork experience? 7. Where would you take a visitor for an essential country food experience? Down the Backroads trail, even though it’s on our door step between Moama, Deniliquin and Barham there are quite a few nationally recognised producers I’d always love to show off. 8. If you could visit any city for a day’s eating and drinking experience, where would it be and why? Melton Mowbray in Lincolnshire, England. The home to the pork pie, it’s also the birthplace of stilton cheese. 9. What other local artisans or producers do you admire? Why? 10. If you had to choose your last meal, what would it be? Now that’s a hard one, Pete would say a black pudding buttie (sandwich), Jane would say sausage and mash and I’d go lamb chops! Fred Siggins, senior bartender at Black Pearl in Melbourne & whisky expert for The Humble Tumbler, shares his passion and expertise with us this month for our artisan feature. Voted in to the Top 100 most influential people in the bar industry in Australia, Fred boasts an extensive knowledge of whisky, cocktails and their origins, tastes and tales. He is also the brains behind Junction’s unique cocktail menu and will be the host of our Whisky Masterclass on October 11th. How long have you been in the bartending trade? I’ve been bartending for 7 years, but I’ve been working in hospitality for 18 years now. I started out in the kitchen, and moved to the bar because I wanted a more flexible schedule, and more social interaction as part of my job. In the bar there’s this feeling of instant gratification when someone enjoys a drink I’ve made, and I get to talk to an amazing cross section of humanity. What did you do previous to bartending? Before I started bartending I was a chef, an English teacher, a human rights advocate and a photographer. I also have a degree in Political Science. I’ve done a lot of different stuff, but I always come back to hospitality. Is there a specific beverage that has always caught your eye? For the most part, I’m an equal opportunity drinker. I love beer, wine, sake, everything. But cocktails and whisky have always had a special place for me. Cocktails because of what they represent culturally and creatively, and whisky because I’ll never run out of different drams to try, and every bottle holds a unique story and flavour. What’s your number one tip for the ultimate whisky drinking experience? Find a bottle you know you’ll enjoy, pop it open with friends, and take the time to enjoy it and each other’s company. Whisky isn’t about the best and rarest bottles or the most opulent setting; it’s about slowing down and sharing a moment with mates. Where in Australia would you take a visitor for an essential whisky experience? The Baxter Inn in Sydney would have to be one of the best places in Australia, if not the world, to drink whisky. It’s loud and fun and the selection is amazing. Here in Melbourne, I always take folks to Whisky and Alement for a quiet dram because the crew there are knowledgeable and friendly and will always take the time to have a chat. But for the essential experience, I don’t think you can beat a tour of the distilleries of Tasmania. I’ve never been to Tokyo, so it’s right up there. They’ve got some of the world’s best bars and restaurants, and I love Japanese food, sake and especially whisky. What other local artisans do you admire? Why? I have a huge amount of respect for Clare Burder from Eminence Wines and The Humble Tumbler who has built a fantastic brand of wine and a totally original wine, sake & spirits appreciation business. I also love the guys from Tequila Tromba, and from New World Whiskies (Starward) for driving the home-grown spirits industry and creating products that represent Melbourne and what’s great about our bar scene. My last meal would have to be my mother’s chicken soup. Or a swimming pool full of Scotch. Conceived by Ben Kraus in 2004/05, in his dad’s back shed, Bridge Road Brewers has grown to one of the most recognized craft breweries in the country. Regarded as one of the Australia’s benchmark craft beer producers, Bridge Road Brewers, located in picture perfect Beechworth is also open to the public. This brewery offers the complete craft beer experience to it’s visitors. Along with the brewery, located in a 150 year old coach house ,you will also find our renowned pizza restaurant, a ten tap tasting bar and large family friendly beer garden. How did Bridge Road Brewers get started? What was the inspiration? I’m not sure I can put my finger on the exact moment. But it was sometime in 2002 that I gave the idea serious consideration. After living on and off in Europe (Germany, Austria and Scotland), I’d been given a taste of what was out there once away from Australian shores. And, more importantly, what was lacking in Australia each time I returned. Why Beer? Mainly because it was something that was really lacking in Australia. Is there a specific beer that you are fond of from your brewery? Only one beer! It’d have to be something big and memorable, drunk slowly and enjoyed over a range of temperature. I’d probably go with one of our B2 Bombers, if not the one we’re about to release (Mach 5.0, which is on tap at a few places and out in bottle soon) then last year’s Mach 4.0. What’s your number one tip for the ultimate beer experience? Do your research and don’t pack too much in, pick somewhere that has something other than beer to offer and take your time to enjoy beer as the locals do. If you could visit any city for a day’s eating and drinking experience, where would it be and why? Having been there a couple times recently I have a great appreciation for the emerging and huge craft beer industry. Rome has taken their traditions of dining and added an extra dimension, craft beer! When in Rome forget the wine, it’s the new craft beer places that offer the true cultural experience. What other local artisans or producers do you admire? I’m quite fond of Sorrenberg winery, it’s where I worked after school and is a place where the land and production takes pride of place ahead of everything, particularly marketing and spin. If you had to choose your last meal, what would it be? Beer, because I got no choice, right? 1. How long has Bundarra Berkshires been operating? 2. How did Bundarra Berkshires get started? What was the inspiration? It all started when I couldn’t source good quality heritage free range pork when I owned the Long Paddock Food Store in Koondrook. I knew I would end up farming being a 6th generation farmer in the district, but I never thought I would end up farming pigs. After a trip to France and seeing the charcuterie they make from Pork I became slightly obsessed. 3. What did the founders do previous to starting Bundarra Berkshires? I co-owned the Long Paddock Food Store in Koondrook and previously worked as an Environmental Project Officer for Murray Irrigation. My husband Lachy still runs the family transport business in Barham. Pigs inspired me in France, they are super resourceful they are good for the paddocks and then we use every single bit in the butchery. They are very intelligent and we get to know all the pigs after a while, so it’s a very personal experience farming them for meat. We also sell breeding stock to other breeders. 5. Is there a specific dish or way you would recommend to use Bundarra Berkshires Pork, or other products? Always undercook and then rest fresh pork cuts. The worst mistake anyone can do is to overcook pork, it is a succulent juicy red meat and should be respected. Our charcuterie is best eaten at room temperature. Dry out crackle in the fridge overnight then use good sea salt and no oil to roast at a high temp. Cook shoulders for 12 hours on super low for the maximum flavour and texture effect. I’d take them along the Backroads Trail to visit real framers and experience their farms and the food and wine they produce. Its a tasty way to explore the country and you will meet the friendliest people (and probably get a job if you stay too long!). Melbourne… the best food and coffee in the world, lots of local foods on menus. Roast pastured chicken with tarragon, pancetta and verjus, buttered greens and paris mash. How long has 666 Vodka been operating? 666 Vodka was launched 5 years ago. There was another 3 years of research, planning, tasting and testing before we launched. How did 666 Vodka get started? What was the inspiration? 8 years ago I realized that there weren’t any internationally recognized Australian spirits, and even in the Australian market there was only a few fledgling Tassie whiskey producers and I thought if Australia can produce world class wine and beer, then there is no reason why we can’t produce a world class vodka. What did the founders do previous to starting 666 Vodka? I had been in the Melbourne hospitality industry for 20 years, owning and operating a few small bars and restaurants including Kazbar and multi award winning MoMo Restaurant. With Vodka you get to taste the distiller’s craft with no other influences like barrel ageing or additives, so it is a true pure spirit. Is there a specific cocktail you would recommend to use 666 Vodka? Espresso Martini: The flavour notes and characteristics of 666 Vodka work perfectly with the coffee. What’s your number one tip for the ultimate 666 Vodka experience? Where would you take a visitor for an essential country Tasmanian experience? I would drive them to Cradle Mountain and walk to Crater Falls. On the way back we would stop at Ashgrove Cheese and one of the many boutique wineries. Being Melbourne born and bred, I believe Melbourne is up there with the world’s best when it comes to great restaurants and bars. It’s multicultural population has given it an amazing variety of high quality restaurants, and its laneway bars are world famous. What other local artisans or Vodka producers do you admire? Why? Hellyers Road Whisky . They are a small team of local Tassie’s who through a lot of hard work have quietly started sending their award winning whisky all over the world. And for dessert: One scoop of vanilla ice cream. 2. How did Murray River Gourmet Salt get started? What was the inspiration? The owners were frustrated that they couldn’t find any Australian gourmet salt products and reluctantly had to buy salt from Europe. They set about to develop a gourmet salt product and developed Murray River Gourmet Salt Flakes in 2002. Many chef’s switched from European salt to Murray River Gourmet Salt Flakes and the rest is history! 3. What did the founders do previous to starting Murray River Gourmet Salt? Back in the 80’s they began a salt operation in Hattah, Victoria. This site is still running and supplies raw industrial salt to various industries. 4. Why Salt? Many people don’t realise that there is a large underground aquifer that is saltier than the sea and wants to leak into the Murray River. Murray River Salt is proud to work with the government’s salt interception scheme to fight the effects of salinity and turn a problem into a product. 5. Is there a specific dish you would recommend to use Murray River Gourmet Salt rather then regular salt?? Murray River Gourmet Salt Flakes can be used in place of regular table salt. Use our salt flakes in cooking or as a finishing salt for your dish. Particularly good with steak, seafood or sprinkled on a green salad. Murray River Gourmet Salt Flakes actually contain natural minerals (that’s why it’s pink) and are not processed in any way like table salt which has anti-caking agents and bleach to make it white. 6. What’s your number one tip for the ultimate Murray River Gourmet Salt experience? Place a small amount of salt flakes in a pinch bowl and let guest grab a pinch and sprinkle on their own dish. Many enjoy our flakes with a good quality, freshly baked bread and Australian olive oil – the simple things in life are often the best! 7. Where would you take a visitor for an essential country Victorian experience? We would showcase Mildura by taking our visitor on a paddlesteamer cruise on the mighty Murray River followed by a gourmet lunch at Trentham Estate. In the afternoon we would visit some local wineries and Mildura Brewery to try the local beers and Stefano’s antipasta, before retiring to one of the many great restaurants serving up local produce in Feast Street (Langtree Avenue). 8. If you could visit any city for a day’s eating and drinking experience, where would it be and why? San Sebastian in the Basque region of Spain – a foodie mecca and renowned for its tapas. 9. What other local artisans or Salt producers do you admire? Why? We admire so many food producers in the Mildura region such as Tabletop Grapes, Robinvale Estate, Stefano’s Preserves to name a few. They do an amazing job of presenting local produce in a myriad of product options which showcase the premium quality of the food from this region. 10. If you had to choose your last meal, what would it be? Entrée would be local figs with a rocket salad, main would be an eye fillet steak from Naz Tassone’s butchery served alongside Murray River Salt roasted potatoes and steamed local asparagus with hollandaise sauce, washed down with anything from Trentham Estate winery! Dessert would have to involve something citrus like a lemon tart as a nod to the amazing citrus from Mildura. Sullivans Cove is the quintessential small-batch luxury whisky. Inspired by nature and distilled with conviction, Sullivans Cove was named the world’s best single malt whisky at the World Whiskies Awards 2014. Made with traditional methods using only pure Tasmanian ingredients, each barrel is individually bottled to capture subtle variations – and the result is one of the best whiskies on the market. What was the inspiration? Distilling had recently been legalised in Tasmania after a 150 year ban was lifted and we thought to give it a go. Why whiskey? Because it tastes good! What’s your number one tip for the ultimate whiskey experience? Drink lots of water before bed! If you could visit any city for a day’s eating and drinking experience, where would it be and why? Florence for Florentine steaks and Super Tuscans! What other local artisans or Whiskey producers do you admire? Lark Distillery, for getting the whole thing going. If you had to choose your last meal, what would it be? My grandmother’s roast. Meet Maddie Sharrock, the amazing creator behind Junction’s imagery. How long has Studio Twocan been operating? The business was established two years ago, but we’ve been working together ever since we were little tuckers. I guess we’d consider ourselves in the early stage of operations, but we’re quickly establishing a name for ourselves in Melbourne’s creative industry. How did Studio Twocan get started? What was the inspiration? Being sisters, we have shared a keen and life-long interest in creativity, but our chosen paths have lead us in different directions. Becc – described as direct, organised and pragmatic – has a career within the graphic design realm, and has worked at various prominent design studios throughout Melbourne. Maddie (me) – the impulsive and shameless younger sister – holds a keen interest in fine arts and has pursued a career in art production and is a passionate craftsman. We have always helped each other out on our individual projects whether that be sewing costumes for a high school play, offering an outside perspective on graphic design or just moral support when the pressure is on. We decided to start working together because we work so well together. And we were inspired to create Studio Twocan because we wanted to offer a service that involved art and design. How would you sum up your approach to design? As they say, it takes two to tango, so we now embark on collaborative projects to highlight the power of shared skills and knowledge – to challenge the way we design, create, make and experiment. Our process achieves an innovative link between design and art, with a single focus to produce beautiful and meaningful work. Well for example, Junction vases (designed by me).The Junction vases were inspired by the muddy banks of the Murray River. We wanted to emulate the Earth’s natural beauties, referencing aerial views of the Australian outback. It was very process driven work meaning each direction was a response to the last action. We had no idea how the vases would turn out. The artisan in us takes inspiration from experimenting and getting our hands dirty. The designer is us takes inspiration from beautiful concepts and compositions. What’s one of the most obscure jobs you’ve ever worked on? Currently we’re making a cement lampshade that weighs 50kg, which seems absolutely ridiculous. It’s a design we’re formulating with Iva Foschia from If Architecture. Unfortunately that’s all we can tell you for the time being, as it’s a bit hush hush… so you’ll have to follow us to see how it turns out. Where would you take a visitor for an essential Melbourne or Victorian experience? This is a very hard question to answer as we don’t want to sum-up Melbourne by showing a visitor only one part of it. The beautiful thing about our home city is the variety. When we have visitors we usually meet them at Little King Café under St.Paul’s Cathedral. After a coffee and a morning snack, we would then head over the Yarra to National Gallery of Victoria followed by a visit to Federation Square to see a wonderful Indigenous Art Collection. The rest of the day would be spent wandering about the city, working into artist runs spaces (like Forte Delta, West Space and TCB) and commercial galleries (like Anna Schwartz and Tolarnos). For lunch, we might take them for a cheap feed at Shandong Mama; the best dumplings in the city and in the evenings we would head ‘Northside’ to see whats going on. If it was a Thursday night and we were on bikes, we would then ride around to the different exhibition openings and launches that pop up around that neighbourhood. The evening would not be complete without a visit to Lazorpig for a pint and a pizza. We’re being very selective here but you have to be when you have such little time to show someone around. Also we must say that a must see in Victoria is Wilson’s Prom. But again, it’s very hard to choose just one place. If you had to visit one city for a day’s eating, drinking and art experience, where would it be and why? Being huge fans of refined craftsmanship, art and delicious food, we’d have to say Tokyo. It’s a wondrous city, that offers the whole kit and caboodle. Other then a 50kg lampshade, we’re building our website to showcase the cement ceramic collection. It launches on the 17 of March, so be sure to visit and check out our range. What was your favourite thing about working with Junction? How wonderfully open minded and switched on the team is. They have a great attention to detail, which was experienced at the launch party in November. Enjoying some great food and wines taates, we felt like a million bucks. It’s also been a great opportunity to reunite with the region. We’ve loved our visits, which reminds us of our childhood Summer holidays. Last time I was there I went for a swim in the Murray. The mud between our toes took me way back. How long has Melbourne Gin Company been in business? The MGC has been on the market since July 2013. How did MGC get started? What was the inspiration? Frank Moorhouse in his book Martini – a memoir states, “Every time it is served, the martini represents a journey towards an unattainably ideal drink”. The idea of endlessly pursuing a perfection that does not exist is something well known to passionate winemakers. Having a winemaking background we thought we would delve into the mysteries of gin production. This was largely brought about by our fascination with martinis and all things gin. The notion of the “unattainable ideal drink” led us into a series of trials and experiments and we have become fully immersed in the alchemy of batch distillation and the extraction of exotic and local botanicals. What did the founders do prior to starting MGC? Gin bears a lot in common with perfume. Intricate and complex, production steeped in mystery and alchemy. Like perfume Gin is versatile for use every day and on special occasions. We are curious, we like to experiment and we like the finer things in life. Our initial interest in gin was sparked by an appreciation of Martinis. The more we thought about it the more curious we became. Finally we couldn’t resist the challenge of producing our own. How would you sum up MGC’s approach to spirits, and gin in particular? What’s your number one tip for the ultimate gin experience? Where would you take a visitor for an essential Victorian experience? Victoria is such a diverse state with so much to offer. It would really depend on how much time they had. Perhaps we would take them to the Yarra Valley where they could enjoy the bountiful local produce, wildlife and picturesque scenery. If you had to visit one city for a day’s eating and drinking experience, where would it be and why? Tokyo because of the great eating culture. A lot of time and thought is put into food and drink preparation over there. It is one of those cities where the hidden gems are worth seeking out. The idea that someone can spend a lifetime perfecting the skills required to prepare fish or make noodles dishes is very appealing. There are some amazing food producers that we admire. Baker D. Chirico in Melbourne makes the most amazing sour dough bread. You feel like you are doing yourself a favour eating it. The Yarra Valley Dairy are making some fabulous cheeses. We have done some work with a fantastic local leather worker called Temono whose products are beautiful and definitely worth checking out. If you had to choose your last meal (and accompanying drink), what would it be? Difficult question. Ideally it would be a very long meal. Perhaps a negroni to get the party started then lots of little light courses. Lots of champagne.